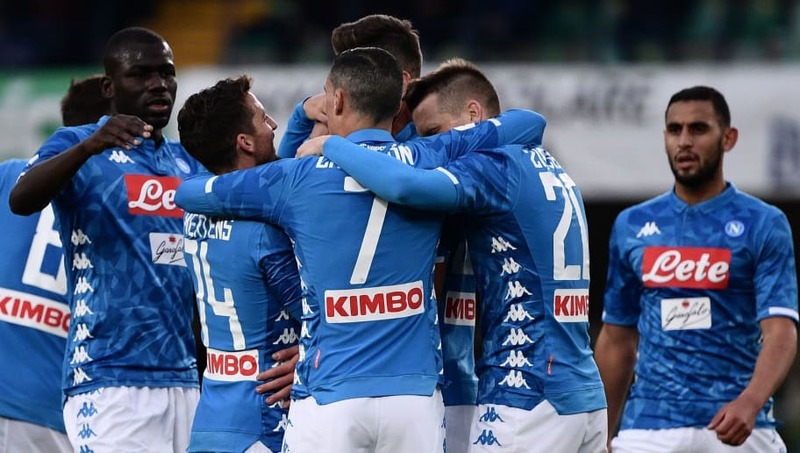 ​Napoli never really left second gear as they won comfortably against now relegated Chievo on Sunday evening, as they put more distance between themselves and Inter in the race for second in Serie A. With a midweek match ahead where Napoli need goals, Carlo Ancelotti would have wanted his side to wet their appetite here against the side from the bottom of Serie A. Napoli won the game by a three goal margin, but it seemed that Ancelotti's players were worried about getting injured ahead of their crunch clash against ​Arsenal on Thursday and never got into top gear. But fans also witnessed his attacking ability at the Stadio Marc'Antonio Bentegodi as Koulibaly imposed himself on the Chievo defence at set plays. The Senegal international opened the scoring after 15 minutes as he deftly guided a near post header past the stranded Stefano Sorrentino in the home side's goal following a dangerous cross by ​Dries Mertens. ​Napoli's next match in ​Serie A is against high scoring Atalanta, which could be a tricky fixture, even if the Partenopei are at home. Before that though, Ancelotti and his men have the task of overturning a two goal deficit when ​Arsenal visit on Thursday in the Europa League quarter-final second leg, as Napoli look to win the competition and end the season with some silverware.